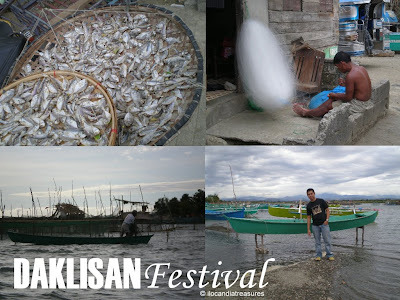 La Paz is a fishing village of Laoag City in Ilocos Norte. Daklisan refers to fishing. 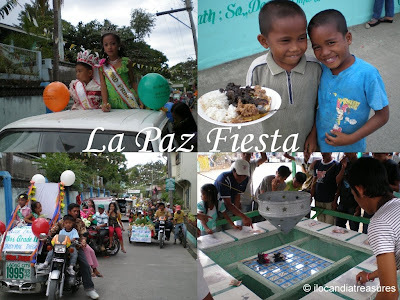 They just celebrated their fiesta in honor of their patron saint Nuestra Senora de La Paz, the Lady of Peace and Safe Voyage. The village was named after this patron saint. This is the only place I know in Ilocos that prepare and serve foods in most houses during fiestas. This is the best time for the locals to let their new babies be baptized and the weddings of couples to take place and so they just coincide their parties to the fiesta. I just heard from a client that this village is celebrating fiesta so I rushed to the jeepney terminal to ask the drivers of the details. The jeep fare was Php14 one way. I went there in the afternoon to witness the parade of muses. These were little local girls in their gowns who were escorted by young boys who rode their respective floats decorated with flowers. They paraded from the village to the city center and back again. Since I don’t know someone from this place, I went to visit the river immediately after the parade. I saw several motorboats anchored and some ply around the waters. Bilog is the term for banca. I saw two boys and asked to ride with them. We crossed to the other side. They informed me that there was an upcoming boat racing by the fishermen. I have seen some of them rehearsed. However, the event did not push through. When I saw a group of men and young boys readying their boats I asked to go with them. I had a free ride to near the Gabu area. They went to check the fish cage called bukatot and dived in the water to test or palpate the bobo that catches the ipon, a very tiny fish. We were not lucky since it was clear. Their catch becomes lesser and lesser after a week. This is seasonal and you have to count number of days before they appear abundantly by considering the appearance of full moon. I had a great fun experience of their fiesta especially on the river. It’s a promising eco-tourism destination if only they develop a program adding events to their fiesta such as daklis or fishing on the river, river boating, fluvial parade of the muses with the image of the patron saint or a floating restaurant during fiesta.